Dereck Chisora continued his comeback with a bang at London's Wembley Arena on Saturday, taking away the perfect record of America's Malik Scott. 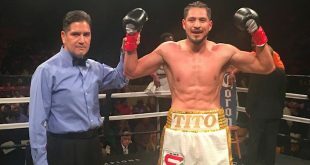 The Finchley man also took a step toward another world title shot by adding the WBO International strap to his trophy cabinet with the sixth round stoppage of Scott. 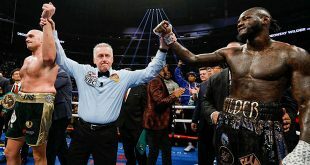 As expected, the much smoother boxing visitor was able to avoid most of the incoming from the always forward marching Chisora during the early frames, relying on the jab and body shots to keep the local man at bay. The persistence of Chisora paid off in the sixth when one of his chopping right hands suddenly found the mark, clipping Scott on the top of the head. 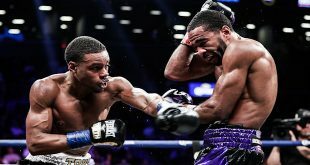 The disorientated American fell to the canvas and then beat the count but was unable to convince referee Phil Edwards and the contest was ended. "Del Boy" moves to 17-4 (11) with the win while Scott gets a loss to fall to 35-1-1 (12). Chisora is possibly now in a position to gain a title shot against World Champ Wladimir Klitschko, who may be motivated to take the fight as an opportunity to address having water spit in his face by the Englishman last year. If that fight happens, do not expect Chisora to make it past the early rounds unless Klitschko decides to string out the punishment over 12 very long rounds.